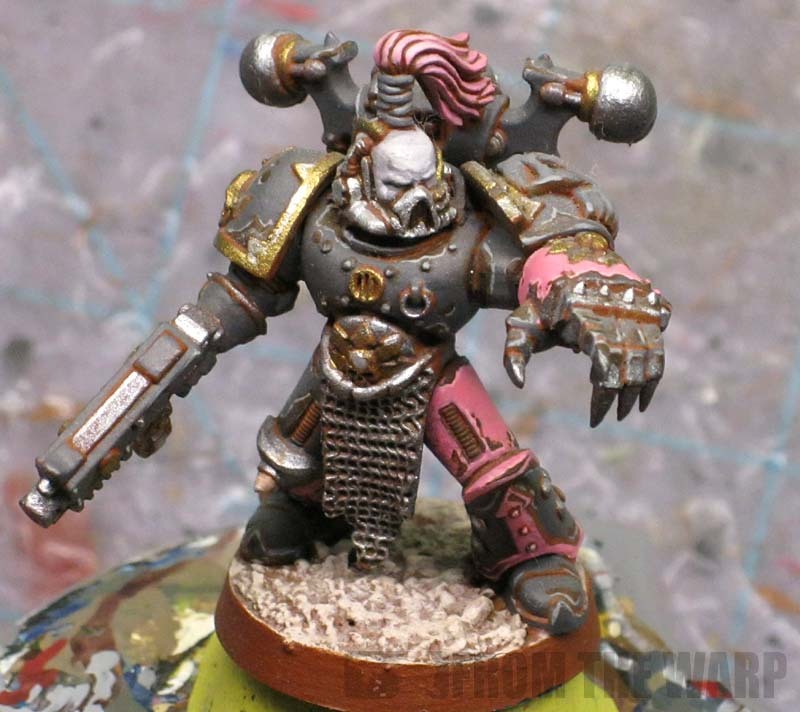 Pink is not a color you often see in 40k unless it's a Daemon army. You see it on the rare Chaos force where the player was bold enough to try painting it. Pink is a tough color to do well. Maybe tough is a the wrong word, maybe the right way to say it would be time consuming. To do pink well, you need to be willing to invest some time into the paint job. Pink is not the only color that is like this. Most light colors are like this. Being close to white in the spectrum, there is very little you can do to highlight and you have to be careful with your shading. To get a convincing look, you need variations to your shading and that's where the work comes in. Most folks will try to do one wash and call it a day in terms of shading when it comes to light colors (Deathwing bone being a perfect example). This works at best for tabletop results. If you go the one extra step, the difference is substantial. My initial attempt at painting pink was a while back. You'll notice there is no shading and only a fine line highlight on the model. That's in part due to the limited color scheme for the model, but it's also from not understanding exactly how to do it as well. 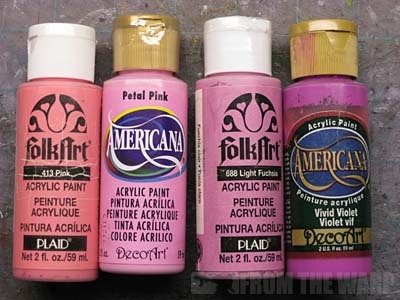 And, you'll notice the pink is rich and saturated... a very easy shade to paint. So how do you paint pink then? The first and perhaps the most important thing you need to decide is what shade of pink you want to end up with. Once you know what shade of pink you are going for, you can assemble your paints from there. I'll say that the lighter and more pale the pink you want, the harder (more work) it is going to be. If you're going for the super saturated, rich pink, that won't be anywhere near as tough to achieve compared to a very light, pale pink. I've got a couple examples in this post. First will be the model I painted and then I'll share a few other test pieces to show you some additional techniques along with their results. And this is true in all cases. 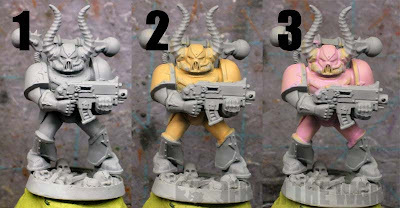 Since we're working with pink, I'm going to advocate a light grey or maybe even more of a white primer for the model. You can always cut in with your black and darker colors that have good coverage. We're trying to make the pink as easy as we can to paint. The one exception to this would be if only a small portion of the model were pink. For my Flawless Host model, I thought light grey would would work, but I should have gone with a white. I wanted a pale pink color in the end and started too dark. My final pink was too saturated and rich in color. After I primed him (1), I based him with a basecoat of GW Elf Flesh (2). This gave me a nice warm tone to work over and created some variety to my pink overall. Over that basecoat, I washed my pink color onto the model (3). In order to get the variation in the shadows, I used two additional colors after I washed my pink onto my model. The first one was Ruby from Secret Weapon miniatures and then P3 Sanguine Base for the deepest recessed areas. Both of these were diluted and added to key areas to help reinforce the contrast and vary the shadows on the model. 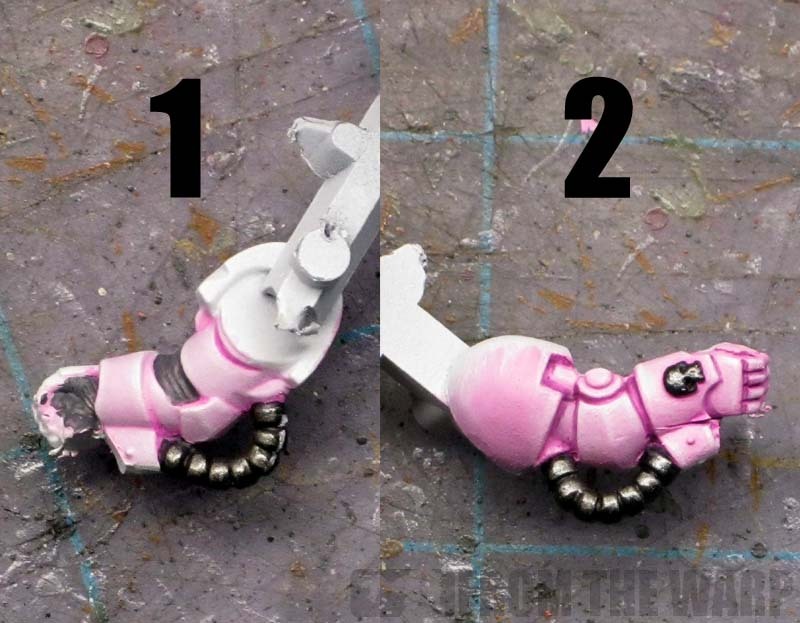 Since I messed up the pink on my Flawless Host model, let's take a look at two shades of pink and how to paint them. One is very light and the other is a bit darker. The idea translates over to any shade of pink. 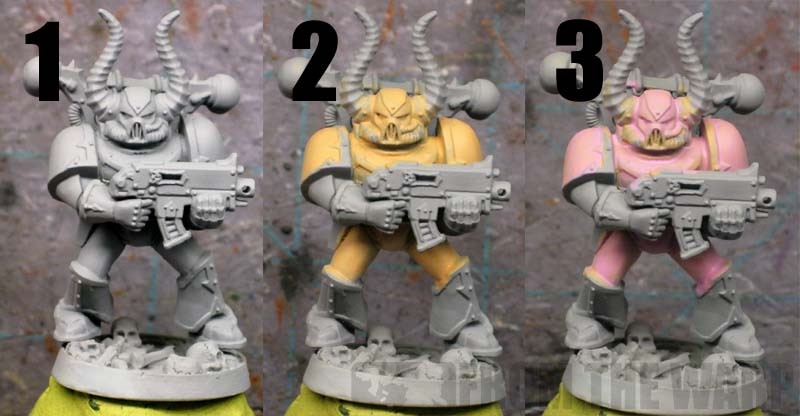 You just need to figure out your colors first and do a test model to make sure you end up with the shade of pink you want and not something too dark in the end. Both examples start out with a white primer so that we can minimize the number of layers we need to paint on the model and keep from obscuring surface detail. The first example has a basecoat of white. Over that, the light pink color we chose is washed on there. Notice I did not say painted... I thinned down my pink color and washed it over the white basecoat. This keeps the pink super light and gives the white base just a hint of pink color. The next step once that dries is to reinforce our shadows. By taking our next slightly darker color, we add it (black lining) to the recessed areas only in order to give the armour some depth and keep it from looking flat. The effect is helped by adding a thin line highlight of white to the upper edges of the armour plates. Black lining is just line line highlighting except in reverse. You are using a darker color and carefully painting it in the recessed areas in order to make them darker. The second example is a bit darker and painted slightly differently. Instead of the white basecoat, we use our light pink and paint it on making sure we have a good, smooth coat to work over. Over that we wash our second pink color to help define the edges and create some shadows. We finish it off with another darker pink (almost purple) in the deepest recessed areas only to give us the variations in the shadows we need. And again, like the first example, the effect is helped by going in and line highlighting the upper edges of the armour plates with our original base color. Pink is not impossible to paint. The real work is on the front end in determining exactly what color combination you need in order to get the shade you're looking for. It may take a few test models before you're happy with the results, but believe me, it's well worth it. Most light colors can cause issues because any shading by way of washes will darken them overall. You need to be careful when applying your shading so you don't darken down your model and lose the lightness that you've worked so hard to achieve. This is only made tougher since you need to follow that up with black lining to introduce some variety to the shadows so the area doesn't look flat in the end. If you're willing to invest the time into getting the right color combination and then following through with careful shading, you can get any shade of pink or light color for that matter. I still have a pot of titilating (the old one from the Creature Paint Set) and tentacle pink. I find the oldest color has a fluorescent tinge to it, quite unsettling if applied directly. I don't think I've ever been able to find a proxy for it due to its super intense, yet light appearance. Have you tried any of the new GW pink colors? These models are being painted primarily with the new Emperor's Children and Crimson Shade. Great post, Ron! I'm planning on working on a unit of Pink Horrors in the near future, and this is great advice! Dain Q. Gore: I have not tried any of the new GW pinks just yet. Pawel Cynk: Yes indeed, same thing applies to yellow as well. It's the lighter colors that can throw folks for a loop since they require a different approach. EastwoodDC: Thanks for sharing the link. It's always interesting to see how others tackle the same colors. You never fail to help me. 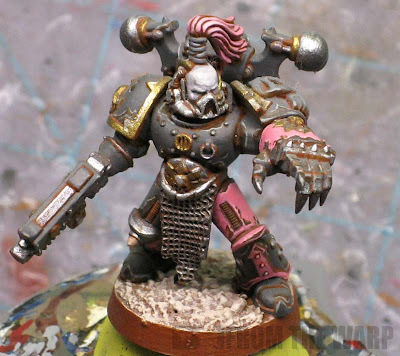 No sooner do I get my DV set to begin painting my Emperor's Children, you write an article on pink. 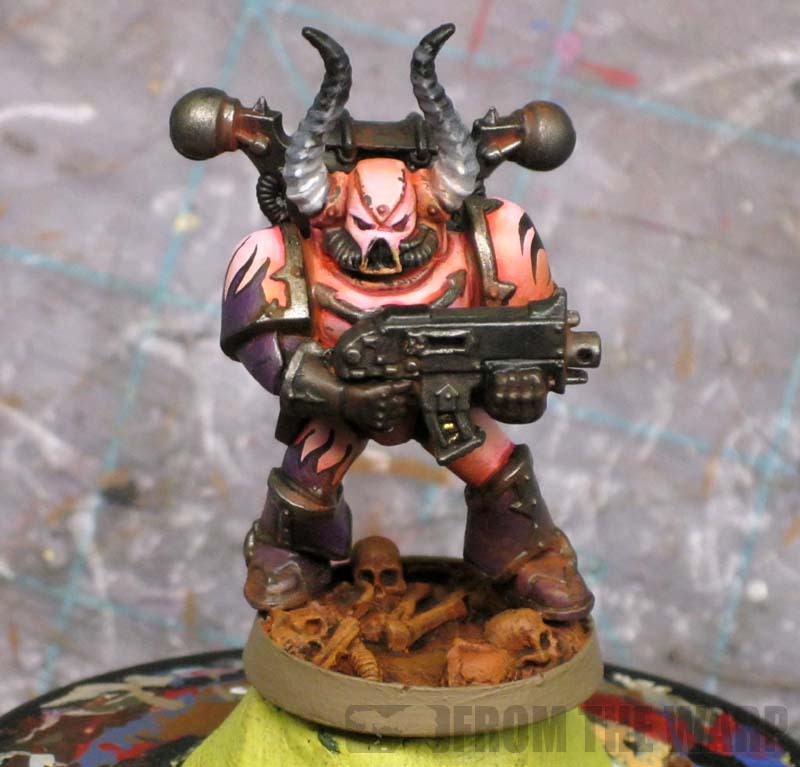 Thanks Ron, and thanks again for sharing the recipe for another pink army that you painted. I am looking forward to my (mis-)adventures in pink. Corey Lyon: Excellent! Hopefully it will help you get started. Chambers: No problem. Glad it helped. 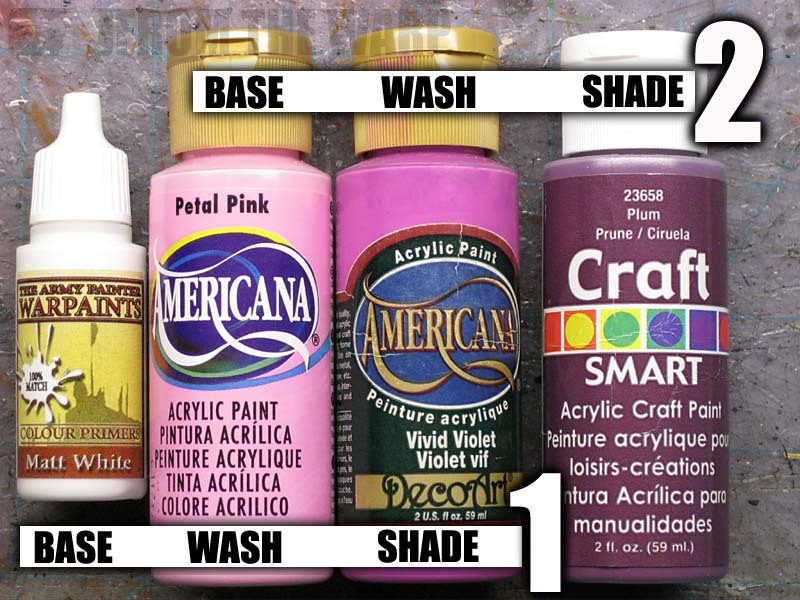 Are you adds anything to the washes besides water? I would like to ask, how long did it take you to paint the flawless host model? and is this any longer than others that you have done? Anon2: No longer than any other model. It might actually be quicker. I did a number of test models before painting the actual model so that I could take pictures and be able to explain the process better. Just like any other color, once you know your "formula," it goes fast. The longest part being the time it takes the pink wash to dry. I don't know, I quite like the pink you have on the Flawless host. It's quite a warm, solid colour as some pinks can come out as too pale, and a little washed out. Mind you, that could be why people don't try it very often. warpedreality: Thanks. The biggest thing I took from this whole project was pink is one of those colors you need to have your formula down before you start painting. Since it's a light color, it can quickly become too dark and change the overall look of the model. Great tutorial Ron. In regards to painting yellow. 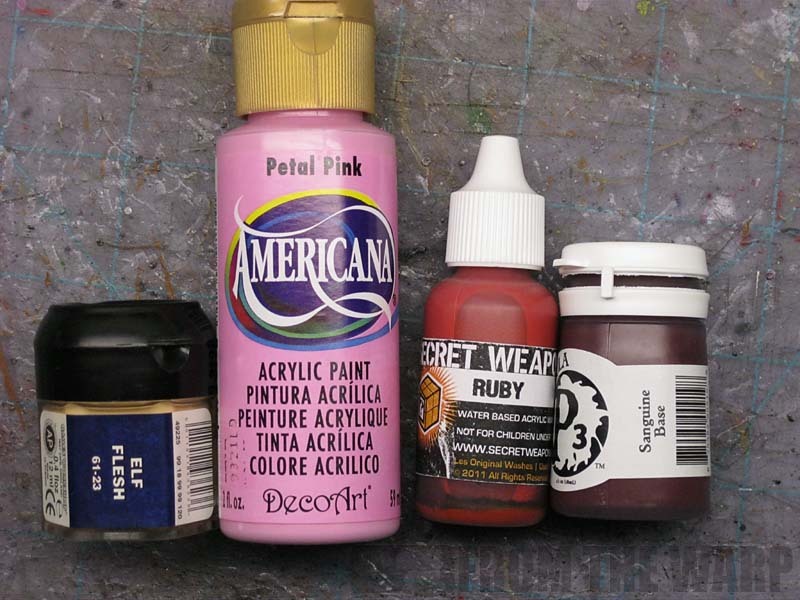 Tyler Mengel has this tutorial on applying yellow washes over a white base coat. Messanger of Death: I saw that one and it is very nice indeed. Yellow is another one of those colors that has a tendency to scare folks away. I need your input. How would you weather pink? I always like my marines to look like they have been actually fighting and aren't fresh off the parade ground. Also, I imagine that even ten thousand year old Slaanesh worshippers have some bumps and scraps here and there. I thought about using grey, but I don't know if it contrast well with the pink. It's just a slight modification to the normal process for me so the weathering looks better over the lighter colored armour.